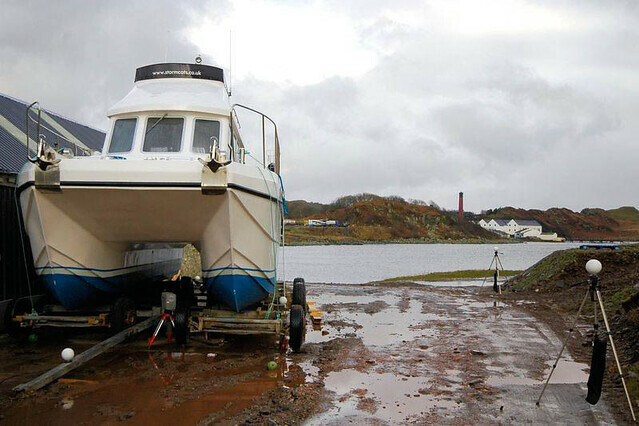 Based next door to the famous Lagavullin distillery on the island of Islay, Scotland, Stormcats are the largest producers of commercial fibreglass boats in Scotland. 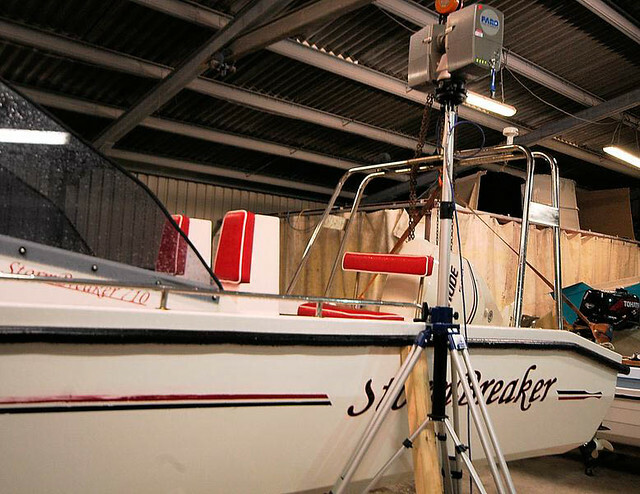 With a range of vessels from classic rowing boats to 10m catamaran fishing boats, Stormcats have the reputation of providing fast, efficient and rugged hulls. Always keen to make the best use of technology, Stormcats approached Glasgow based Naval Architects Marine Design International (MDI) for advice on improving the flexibility of the existing hull range and creating the next generation of hull molds. MDI are long term associates of DJA, having worked on many marine projects together, from fishing boats to superyachts. MDI's awareness of the use of laser scanning on larger projects and a discussion on the reduction in the cost of the service led them to recommend it's use on these smaller vessels. GSS/DJA suggested scanning the existing range of hulls using our FARO LS 880 laser scanner, producing a high resolution point cloud model of the hull shape, accurate to +/-5mm. To maximise Stormcats' return on their investment in scanning, a fast method of scanning the hulls was devised, allowing the entire range of hulls to be scanned in one session. A total of 18 scans were carried out, capturing an average of 17 million points per vessel. Hulls shapes varied from a simple rowing boat to a complex, high speed hull shape known as a "Cathedral" hull. Traditional Naval Architecture techniques for capturing hull shapes using plumb bobs, tape measures and optical levels would have required many hours of patient measurement and would never have been able to provide the level of detail achievable with the laser scanner. 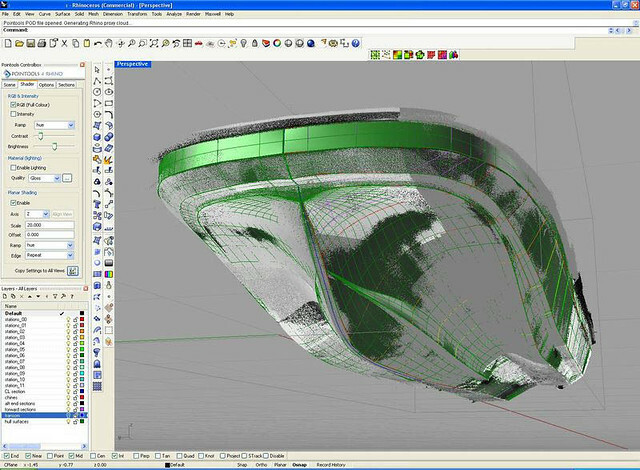 On return to the office, the laser scans were cleaned and separated to create point clouds for each of the hulls in FARO's Scene software. Aligned to a common centreline and vertical axis, the point data was imported to Pointools and then to our Rhino 3D CAD software. Rhino is well recognised for marine modelling and a fast workflow for creating accurate 3D NURBS surface models from point cloud data allowed GSS/DJA to supply MDI with clean CAD data. Accuracy of the 3D CAD model was continually checked against the original point cloud data, giving confidence in the supplied data. 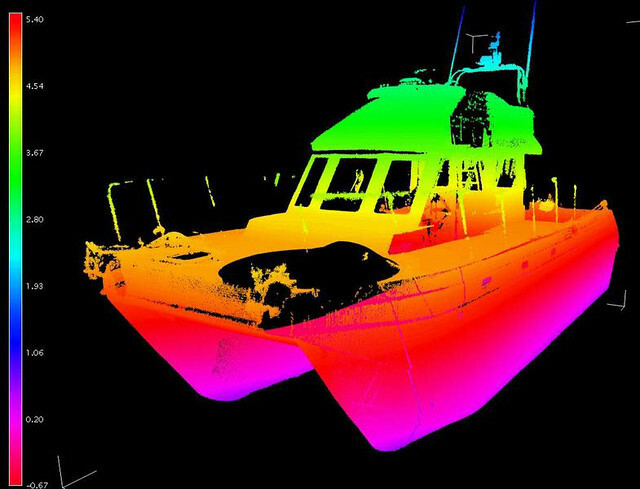 CAD model/ point cloud mapping also allowed MDI and Stormcats access to information on the symmetry of the hulls – critical when dealing with fast vessels and allowing improvements in performance and efficiency.